The sine-trap renders have a great art-deco look to them but are hard to find good color settings for. In addition to this they often have a very rough, jagged look. 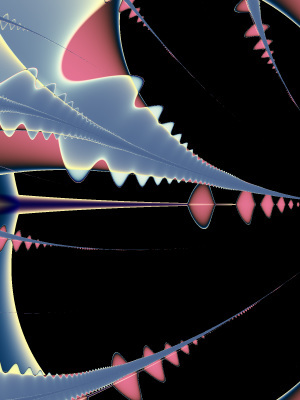 This one has been anti-aliased 4:1 to give it a smoother, polished look which comes naturally to most other fractals. To do this you have to start with dimensions which are exactly four times your final image size, in this case 1200x1600, which takes a while to generate. The extra time is worth it as the sine-trap images take on a very polished look without any blurring of detail which is a common drawback when anti-aliasing most other fractals, especially 4:1.